Of course, Moroccan brochettes are usually cooked on the grill, but in this traditional Moroccan dish, the seasoned, cubed meat is cooked tagine-style in a saffron-flavored onion sauce. It's quick, easy and very satisfying, particularly with the optional addition of poached eggs. The name of the dish translates to "betrayed kebabs," a playful reference to the fact that the kebab meat never makes it to the skewers. No worries, though, as the final result is just as delicious as its grilled cousin, and it may just become your go-to dish for unexpected company or lazy Sunday dinners. Trim the meat of fat and cut into small brochette-size cubes. We like the cubes to be petite, about 2 cm or 3/4-inch. Combine the meat with the spices, onion, herbs, lemon juice, and oil. Use your hands to massage the spices into the meat and set aside. If time allows, cover and refrigerate for several hours or even overnight. If not, proceed directly to the next step. Grate the onions and transfer to the base of a tagine, a deep, heavy skillet with a lid, or other similar cookware. Add the oil, butter, and smen and bring to a simmer over medium-low heat. Add the saffron and cinnamon. If extra zesty seasoning is desired, you can also add a little ground ginger along with some ground pepper or cayenne. Stir to combine. Add the meat, scraping the bowl to include all the onion and herbs. Add the water. The level of liquids should be enough to nearly cover the meat. Cover and continue cooking over medium-low heat until the tagine reaches a simmer. Simmer for 30 to 40 minutes, until the meat is cooked through and tender and the sauce has thickened and reduced. Remove from the heat and garnish with fresh parsley. Serve the Kebab Maghdour directly from the tagine or pan, or transfer to a serving platter. It's traditionally eaten by hand from a communal dish, with each diner eating from his side of the plate, using pieces of Moroccan bread instead of a fork. 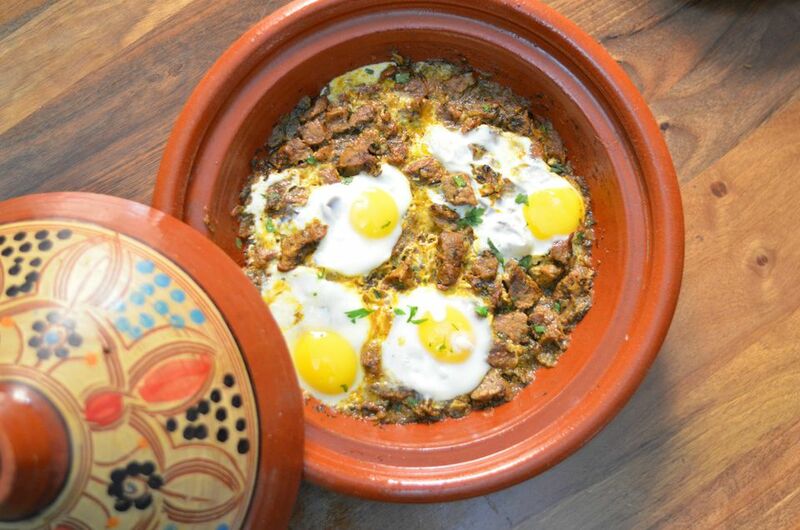 Although the photo shows the dish as prepared in a tagine, don't worry if you don't own one as Kebab Magdhour is just as easily prepared in a skillet or other similar cookware. If using the optional smen, you may want to reduce the salt a bit when seasoning the meat. If you'd like more sauce than what's shown in the photo, use the larger amounts of onion, oil, and butter and slightly increase the seasoning. As with so many Moroccan recipes, you'll find many variations, but the basic premise here is that the meat is given the same initial seasoning treatment as brochettes. With that in mind, you'll want to use a high-end, tender cut of meat such as beef fillet or sirloin, or lamb leg or lamb shoulder. Marinating the meat for a few hours or overnight is recommended but not mandatory.